Today I‘m lucky to have Bernie Thompson back on the show. Bernie is someone who I had on back in episode 157 and in case you’ve forgotten, Bernie runs an 8 figure business called Plugable.com which is a company that sells USB and Bluetooth devices online all over the world. In addition, he’s built all of his own tools in house to manage his Amazon business which he now offers to the public called Efficient Era. Anyway, the reason why I have Bernie on the show today is to talk about how the Amazon landscape has changed in just a single year and how his business has evolved. You’re listening to the My Wife Quit Her Job podcast, the place where I bring on successful bootstrapped business owners and delve deeply into what strategies are working and what strategies are not in business. Now today I’ve got my friend Bernie Thompson back on the show. If you don’t remember Bernie, he runs an eight figure electronics business on Amazon called Plugable. Now things have changed a lot in Amazon land in just the past year. And today, we’re going to talk about the Amazon landscape and how Bernie launches new products today. But before we begin, I want to give a quick shout out to Klaviyo who is a sponsor of the show. Now I’m super excited to talk about Klaviyo because they are the email marketing platform that I personally use for my ecommerce store, and I depend on them for over 30% of my revenues. Now Klaviyo is the only email platform out there that is specifically built for ecommerce stores, and here is why it is so powerful. Klaviyo can track every single customer who has shopped in your store and exactly what they bought. So let’s say I want to send out an email to everyone who purchased a red handkerchief in the last week, easy. Let’s say I want to set up a special auto-responder sequence to my customers depending on what they purchased, piece of cake, and there is full revenue tracking on every single email. Now, Klaviyo is the most powerful email platform that I’ve ever used and you could try them for free at mywifequitherjob.com/K-L-A-V-I-Y-O. Once again, that’s mywifequitherjob.com/K-L-A-V-I-Y-O. I also want to give a shout out to Privy who is also a sponsor of the show. And Privy is the tool that I use to build my email list for both my blog and my online store. Now what does Privy do? Well, Privy is an email list growth platform and they manage all of my email capture forms. And I use Privy hand-in-hand with my email marketing provider. Now, right now I’m using privy to display a cool wheel of fortune pop up. Basically a user gives their email for a chance to win valuable prices in our store. And customers love the gamification aspect of this. And when I implemented this form email signups increased by 131%. So bottom line, Privy allows me to turn visitors into email subscribers, which I then feed to my email provider to close the sale. So head on over to Privy.com/Steve and try it for free. And if you decide you need some of the more advanced features, use coupon code MWQHJ for 15% off. Once again, that’s P-R-I-V-Y.com/Steve. Now onto the show. Steve: Welcome to the My Wife Quit her Job Podcast. Today, I’m lucky to have Bernie Thompson back on the show. And Bernie is someone who I had back on episode 157. And in case you’ve forgotten, Bernie runs an eight figure business called Plugable which is a company that sells USB and Bluetooth devices online all over the world. And in addition, what’s cool about Bernie is that he’s built all of his own tools in-house to manage his Amazon business, which he actually now offers to the public, and that company is called Efficient Era. And in fact, I’ve been using Efficient Era for my Amazon business for the past couple years, and I have nothing but good things to say about the software. Anyway, the reason why I have Bernie on the show today is to talk about how the Amazon landscape has changed in just a single year since I last had him on the show. And as you know selling electronics is quite possibly one of the most competitive niches that you can go into. So it’ll be interesting to see how Bernie continues to adapt and evolve his Amazon business. And with that, welcome to show Bernie, how you doing today? Bernie: No, great. It’s great to be back on Steve. Steve: So just in case the listeners don’t remember your business, can you give us a quick recap of what you sell, how many products you have, and how often you actually launch new products? Bernie: Yeah, so we started in 2009 like everybody does with one product. We’re now up over a little bit over 100 products, about 120, 130. We try to launch two to three a month if we can. I used to manage the USB Bluetooth teams actually at Microsoft and Windows, so we often say we’re a technology company first and an Amazon seller second, and that kind of comes out in the way we do business. So we across those technology areas we try to be right on the cutting edge, right on the bleeding edge kind of tracking the standards bodies, tracking the chipsets that are coming out and trying to have a complete line of products at least in the USB space. So yeah, so that’s the area we’re in with Plugable. Steve: Yeah, I mean that’s quite an aggressive launch schedule right? So you’re launching a product a week almost. Steve: So, I was just curious, last time we spoke you were all Amazon for the most part. Have you started selling on other channels now, not outside of Amazon, but mainly on your own channel I guess, on your own website right? Bernie: No. We still do not sell on our own site, your choice there is basically do I send that traffic to a marketplace platform where that traffic will kind of spin up a flywheel and generate even more sales, or do I take that sale and kind of build my brand, build my own customer base, kind of independent of these marketplaces? And still to this point, even though we often think about it and debate it, and at times I kick myself, we still send all the traffic we can to the marketplaces to get our products spun up there particularly Amazon. Steve: Okay. Yeah. And since you launch products so often, you’re like the ideal person to ask, how has launching new products on Amazon changed in the past couple of years? Bernie: Yeah, I mean, when we first started in 2009 through about 2012, I mean, it was this kind of like, Gold Rush period for the early sellers where if you had a pretty good product and a pretty good price, and you just did a few things better, like even simple things like just having a good listing, you had a pretty amazing hit rate. I mean at least every other product or so was a pretty big hit. So it’s progressively just gotten harder and harder over the years. I don’t think there’s been any kind of really dramatic point where it’s suddenly became way harder. It’s just tighter and tighter each year, starting about five years ago. You started having all these kind of mastermind groups and people really realizing that Amazon was a place to kind of start a business quick, and then three or four years ago you started having that happen with all the Chinese sellers who many of whom are very close to factories. And then throughout it all, for us in the electronics category, there was a very important brand that launched right around the same time we did and that’s Amazon basics. And so the competition from Amazon basics just keeps kind of tearing at the top of every top selling category, every top selling product starts facing Amazon basics competition after a while. So yeah, just in terms of pure competitive picture, definitely tighter each year. Steve: So, has your launch strategy kind of changed as well with the increasing competition? Bernie: I think we had a really, we’ve had some things that are consistent that have actually remained the same year to year and then other things where we really did a horrible job before and then we’re doing a better job now and maybe that’s essential for us to keep up. I think the thing that we’ve done kind of well all along is had a clear brand and a clear message Plugable, where we sell USB products. We can help you connect this with that. We’ve got a lot of great information and content out there to help you figure out what you need to buy and all compatibility works. And we do content and we do videos, and we just invest in enormous amount in content marketing around that. That actually was what we have done consistently well the whole way back to 2009, but those early years we were erratic with our advertising. It was mostly Google AdWords the first few years, but we did kind of flopped that whole budget over to sponsored products within a year or so of sponsored products coming out. We saw that the effectiveness per dollar was way higher with sponsored products than it was with Google AdWords, but kind of other marketing aspects. In a way we’ve always, historically we’ve been a kind of an anti marketing company. Our technology sells itself and we support our products so well, yeah, right. And so, what sounded kind of cool in the early years started looking foolish I think a few years ago. And so, we’ve been going through a process of really trying to kind of put ourselves back to school on marketing and do a lot of classic marketing activities like having a PR agency. We have a PR agency this year for the first time in the company’s existence. Bernie: We have a dedicated marketing team that we’ve built over the last year. I didn’t have a single marketing specialist two years ago. So a lot of kind of back to basics, how do you market products are necessary now on to even to keep up on Amazon and certainly to flourish on Amazon. And that’s a big change. It wasn’t really necessary a few years ago. You could just kind of launch and do a few things right, and now you’ve got to do a lot of things right. Steve: Can you talk about like when you launch a new product, what the exact steps that you go through to launch it? Bernie: Yeah, so we’ve started doing business plans on every product. It used to be that we did a simple kind of just a business model where we looked at input costs and Amazon fees and what price we’d be at. And now it’s turning into something that has to be a more full business model. We have to look at, okay, so what are the keywords we think we’re going to be able to rank for, for this product, things that are differentiators for the product, more broad kind of keywords for this category. Steve: How do you decide on those keywords and what tools do you use to research that? Bernie: Yeah, so our tools in Efficient Era don’t cover this area in terms of keyword research right now. So we’re using a mix of mostly Helium 10, and then there’s a lot of other kind of good keyword tools out there. We have Jungle Scout, we have Viral Launch, Sellics is another great tool. So, we’ve tended to focus in on Helium 10 so far, but I think there’s other good tools out there. And it’s basically because we need to understand what run rate do we need to get up to be number one, or at least first page for these keywords that we think that our product is relevant for and our maybe our key differentiators also. Steve: So what are the keyword volumes that you go through, and kind of what are your assumptions in determining whether you want to launch that product or how to launch it? Bernie: We don’t worry too much about — so we’re fortunate that we have the funnel. So okay, sorry, when you’re thinking about this and you’re kind of analyzing whether to do a product, one of the key analyses is for the keywords that are important for this category, what’s the run rate? And can I afford in a first purchase order to go — can I afford to get enough of that product and potentially have a discounting or giveaway strategy and a strategy with ads where I’m going to spend above ACOS for a while, and other sorts of kind of sunk investments in the product? Can I afford to have all that inventory, and all of those costs and succeed in that category? And I think every seller has kind of limits in terms of how big of a category can you target and be able to realistically look at that. For example, we just recently went through an analysis where in the past we’ve competed head to head with Anchor, which is a well known really awesome company directly in our space kind of a direct competitor. And so, we were looking at maybe taking another run back at very simple USB chargers which is a very mature category. And we were looking at a situation where the run rate is tens of thousands of units per month for the top seller in that category. So we would be, when we did out the business model, we would be having to make about a quarter million dollar sunk investment just in inventory to be able to make a run at the top of that category. And so, we’ve just made the decision we’re going to hold off on that for now. We’re going to wait for some technology inflection point or something. But we don’t feel like we’re well — we don’t have a high enough probability of succeeding to be able to kind of dump that big fixed investment right now in this kind of mature category. Steve: When you’re talking about the run rate, are you referring to like giveaways or severely discounted products? Bernie: It’s the whole combination of things. So, it can be giveaways although we don’t actually tend to do a lot of giveaways. It can be discounts, which we do, do direct discounts that we’re doing with coupon codes, Lightning Deals, best deals. The tools that we have written kind of for ourselves, we can analyze that. So when you actually start doing all of that stuff, we calculate how much are you giving away in promotions, how much we pull from the ad APIs, how much are you spending on ads. And so, I can actually see once I kind of started down that process with product in the Efficient Era tools, am I still profitable? Or am I running to this business plan that I created where I’m actually planning to lose money for some number of months with a goal of getting the run rate to where I’m first position or first page for these keywords. And it’s kind of why we need to create these business plans now because I am going to run negative for a few months intentionally. It’s my sunk investment I have to do to succeed anymore on Amazon, but I don’t want to be too negative or I don’t want to be off plan or I can put the business at risk if I go too crazy. So, we now need to do a lot more planning up front and then have a lot more kind of tools to help us monitor how we’re tracking the plan after the fact. Steve: So to be clear, what you’re trying to do is you’re trying to match the sales velocity of some of the top players, in your case Anchor on the front page, and you’re going to need to sell a required number of units by any means necessary to meet that sales velocity and get on the front page? Bernie: Yeah, that’s right. And in that algorithm that Amazon — so to this point really that sales velocity, how many units you sell determines your search position largely, it’s the number one factor in search position, and it’s over a couple different timeframes. It seems like Amazon uses some sort of combination of maybe one day, three days, seven days sales, and probably longer periods 30 day, 90 day. So it’s not a exactly precise thing. And there’s always this danger with all things Amazon that they’re going to shift their algorithm. There’s been some discussion lately of clearly they had been doing their algorithm based on units previously, but there’s been some discussion and concern that maybe in a few categories Amazon often test things first with category specific changes that they switch to a revenue based velocity, in which case doing deep discounting would really start becoming ineffective. So yeah, so you got to also, in addition to go after some big category, you’re talking about really big dollar amounts, you also have an enormous amount of Amazon risk that Amazon is going to — you’ve built this ineffective business model around some Amazon behaviors that could easily change. Steve: Yeah, so I guess in your case, let’s say you’ve done all this business planning and then it’s time for launch. It sounds like you hired a PR company. How do you do the launch? So you have the product in hand and you have the listing up, what are some of the first things that you’ve been doing? Bernie: Yeah, I mean, the main thing is the basics of just correctly educating the market. I mean this product exists for a purpose; it’s probably leveraging something that’s new about technology. It’s just getting that story out. So this is kind of the classic marketing and content marketing stuff. So, being really honest with ourselves about what are our differentiators for real not something that if people really did understand this product space, they would agree, oh yeah, this is a great product for that, and really spending our energy highlighting those things. Steve: When you mention highlighting those things, are you talking about on your YouTube channel or in press releases? Like what are your main channels? Bernie: Yeah, so it’s YouTube is a very important channel for us. So that’s definitely a main channel, also just simple text, blog posts that are also email blasts that go out to our email lists. And press releases are a lot, they’ve been something that is a lot less effective really for a long time now, probably 10 or 20 years press releases have been in a state of decline. There really isn’t much press out there to pick them up. But you can work more kind of one to one with people in like in our area in the tech press, then when you — they tend to be very well informed. And so, when you truly are putting out something that is new or leveraging something new, when you can get their attention and explain that to them, then that might turn into an article where your products are mentioned, et cetera, et cetera. So yeah, a lot of marketing energy across a range of activities. Steve: Okay, so it sounds like when you’re ready to launch a new product, you put out content, you blast your list, and you probably publish something on your YouTube channel just to create awareness of this new product that’s out. In other words, you already have some of these channels in place to help you launch a product. Steve: Okay. I’m just curious though, if you are starting without any of that stuff, how would you proceed and what percentage of your sales come from that versus some other things that you’re doing on Amazon? Bernie: I think in addition, the big thing in addition to those things and the thing that everybody has access to is on Amazon ads, sponsored product ads. So we’re definitely spending a huge amount. In terms of actual spend more on sponsored product ads than we do on the rest of those activities generally. And the great thing about sponsored product ads is it is this well, the cost of them is in a sense going up as there’s more competition for those keywords. Really, it’s a very effective mechanism of getting people to see your product and you can really control this spend. So what we’re doing is all of that kind of keyword analysis that we did as part of the business plan for the product, we’re immediately advertising and trying to win those keywords. So we use our own tool Efficient Era to do that. And so we basically just need to seed our tool with some of those starting keywords and then our tool, each week we’ll go through and recommend bid adjustments up and down based on conversion rates and other metrics, and it’ll also mine the advertising data for more specific searches that people do. That’s one of the cool things about Amazon advertising data is when I advertise on a word like shirt, Amazon will actually come back in the advertising data with all the combinations of keywords that people actually searched for when shirt was one of the words. So they’ll come back and say, white shirt or a shirt for the Broncos or whatever. And so then our ad tool picks up all of that stuff, finds the high converting keywords and prompts you with recommendations to say, now turn this into an actual keyword that you’re advertising on. And Amazon’s keywords have kind of three levels of match, broad, phrase, and exact and as you kind of promote a keyword up those, your ads are shown to fewer people, but you don’t need to bid as high, like on an exact match. It will only show if the person types in exactly that phrase. But then if you have advertised for exactly that keyword that will tend to win the kind of keyword bidding that goes on behind the scenes better than a broad match. Steve: So before we go into the details of all that, which we will definitely go to in a minute, I just wanted to make sure is Amazon sponsored product ads probably the largest piece of your launch strategy, is that accurate? Bernie: Yeah. In terms of dollars it is. In terms of time, it’s not but dollars yes. Steve: Okay. And before we get into the software and whatnot, I just wanted to take a step back for the people who don’t quite — who aren’t as quite familiar with Amazon sponsored product ads and walk me through like your strategy. Like let’s say if you didn’t have the tools, how do you decide on the keywords? What do you bid on it first, and then how does that evolve into these exact and phrase match keywords that you were just talking about? Bernie: Yeah, I think — so it’s very similar to the kind of business model analysis. At first, you’ve probably got some really broad searches that a few of those people are going to actually turn out to be interested in your product. So you’re wanting to think both in that way broadly, what could people be searching for, for my product? But then you also want to think more specifically, okay, so what are some kind of unique characteristics of my product, maybe some of the things that were originally why I chose to launch this product that I could identify some very specific searches that my product should be very, very compelling for? And when you start out, you might find that on those very broad searches, you get a lot of random purchases or maybe not much traction at all because you’re one of — the primary issue on Amazon is you’re in a sea of other products. And you really need to be kind of very specific and very kind of honest with yourself about why would somebody actually buy my product. And so you identify those characteristics, and a lot of times that’s where you get your initial traction with a product. So, you might have a product for example, that is let’s say a shirt, if you’re only advertising on kind of a broad keyword like shirt, you’re going to have a very low kind of impressions to click ratio because people are searching for all kinds of shirts unless yours is some sort of extremely appealing shirt, not a lot of people are going to click on that ad when they’re doing that broad search. Steve: What’s a good guideline that you use for a click through rate? Bernie: Oh boy, that’s a good one. I may actually, I will answer that question in a second, I’m actually going to pull up real data. Steve: Do you run automated — auto campaigns anymore or do you just start out with broad? Bernie: Interestingly yeah. So Amazon has these two different campaign types, auto, and manual. And we do run Amazon’s auto campaigns which are kind of basically just a set of budget and forget it kind of campaign. And we wouldn’t do it except initially there’s a little bit of utility there in terms of keyword harvesting. But that’s not the biggest part of it. The biggest part of it is Amazon has a few ad placement types where they show ads that are only possible with the auto campaign. So, one example of that sort of placement that turns out to be really effective is in the checkout process on Amazon. You’re actually shown especially that last landing page after you’re done buying your product and you’re completely through, they will recommend a bunch of other products to you at that point. For people who are on the seller central side of things, the marketplace side, doing an auto campaign is the only way that I’m aware of to get a placement there. Also placements on competitors products, only with the auto campaign do you get certain types of those placements. So yeah, so we still — and in fact our tool when you create a campaign for a product recommends creating both an auto and a manual campaign for every product. Steve: How do you adjust the budget for the auto campaign compared to the other campaigns that you’re running? Bernie: Yeah, it’s still the same thing where you’re looking at well, the number one metric that we look at is ACOS. And that’s just simply the advertising cost of sales for every — what percent of your overall ad generated sales are you spending in order to kind of get those sales? And it’s a nice number, because it lines up also with your margin. Like, if you have let’s say, a 10% margin on your products, well then you know if you’re selling at a 10% ACOS, you’re about breaking even on those particular sales. Now, you also want to think about the fact that you can’t always make money on every sale. So, we talked about when you’re launching a product, you have to be willing to invest. So on that product where you might net a 10% margin, certainly at first you might have to be willing to have a 20% ACOS and basically lose money on every sale just to get the momentum going, very similar to doing a giveaway or something. And then even later on, you might want to for a long time just simply be breakeven in your targeting because each sale that you generate through advertising kind of spins up the flywheel on your product, it moves you up in search position. And so each sale really is not just that sale. It’s also ancillary sales that you get because of your better search position. And you’re doing a weak form of customer acquisition. Amazon really tries to maintain control over the customers on the platform. And even though they say you’re the seller and it is your transaction, in reality, they of course don’t allow remarketing and all that but still, there is a little bit of stickiness to every customer, and it varies a little bit per category. So again, that’s another kind of multiplier or additive effect where your ad generated sale that customer who becomes familiar with you and your brand has a lifetime value that’s probably bigger than just that one sale. So again, it’s another reason why it’s good to be thoughtful about ACOS but a lot of times you’ll actually want us advertise at an ACOS that is higher than your profit margin on the product. Steve: I wanted to take a quick moment to tell you about a brand new service that I just launched that will help you grow your email list for free. First off, my business is called Gobrandwin.com, and it’s a service that helps e-commerce sellers build their email list through group giveaways. And in fact, in our most recent giveaway, we managed to increase the email list size of the brands who participated by 40%. That’s right, we generated over 11,000 email subscribers, and the average list size of the companies participating in the giveaway was just 25,000. So if that makes you excited, here’s how the service works. If you own your own e-commerce brand, and you have a following, you must first contribute a gift card toward your products valued at $200 or more. And this is the prize for the sweepstakes. We will assemble gift cards from other participating brands with a similar customer demographic into one gigantic sweepstakes giveaway. All participating brands will send our co branded giveaway email to their entire customer base, driving them to a special landing page on Gobrandwin.com. We will acquire email addresses and Facebook pixel data. We will also send the giveaway entry forms to related influencers in our blogger database. And between my co founder Toni and I, we have access to almost 1,000 bloggers in our database. Consumers will enter in their email addresses; we’ll send them special offers from your company, and select a grand prize winner. And after the sweepstake is over, you will receive the entire list of entrants and instantly grow your audience. So bottom line, the concept is very simple. And it is absolutely free. We will help each other promote each other’s businesses, get free promotion from bloggers, and share the email addresses. So if you’re interested in growing your email list, then head on over to Gobrandwin.com, that’s G-O-B-R-A-N-D-W-I-N.com. And once again, it is 100% free. Now back to the show. Yeah, so which brings me to my next question. When you’re launching, what is your target ACOS versus your margin? Bernie: Yeah, for us it’s probably about double our target margin at first. Bernie: And we’ll do that basically until we start getting traction and start getting data. And then once data starts coming in, then our Efficient Era tools then can start refining our bids and our keywords, we can get a sense of is this product kind of succeeding or failing. And there’s definitely times where we launched a product and it just, it hits the market like a rocket in the ground, it’s a thud and we’re not getting traction anywhere, we’re not getting conversions. But we have to spend for a few weeks until we really know whether it’s that sort of situation or whether we have a rocket, something that is just resonating with the market and taking off. Steve: So it’s not like there’s a dial for ACOS, right. So how do you determine your initial bid and then what determines whether a product is a rock versus mediocre which is knocking it out versus knocking it out of the park? Bernie: Yeah, so in sponsored products kind of natively from Amazon yeah, ACOS is not just a knob but it actually isn’t a lot of the tools, like in our tool it’s a knob. You set an account level target ACOS and then you can override that on a per product basis. So we can override it to be a higher ACOS when we’re launching and then later adjust it down to kind of a more normal mature ACOS. So there are tools like ours that can turn ACOS into a knob. Yeah we don’t know ahead of time whether we’re going to have a breakout or a failure. It usually takes at least four to eight weeks of data. One of the big debates among sellers on Amazon has been what do you do about the relationship between reviews and conversion rate and ad spend? When you first launch a product and you’ve got no reviews, your ad spend is going to be a lot more expensive because you’re going to be sending people with these ads to the product. And when a person comes to this product with no reviews, it’s just going to convert more poorly than if there’s a bunch of social proof around that product. So now we’re getting into the whole issue of kind of review gamesmanship and all of that sort of stuff. So, we’ve never paid for reviews or done any of those sort of review gamesmanship things. And that’s meant that we have to be very patient and we have to basically spend more money at first because we know that in those early weeks there’s a real uphill battle to generate those first few hundred sales so that we can get our first handful of reviews. And so, we don’t really know whether a product is going to be successful or fail until we’re kind of through those early weeks. Steve: How do you decide what to bid? Bernie: So there’s a bid recommendation API. And so we pop up a default bid when you create a campaign using our tool and we use our tool ourselves. And then we don’t worry too much about that initial bid because it’ll quickly get adjusted to the target based on the target ACOS to be constantly reminding you to, okay, we recommend bidding up on this bidding down on that. And so in a way, your starting bid becomes a lot less critical because you’re going to be adjusting it every week from then on out based on the actual data. Steve: Okay. And then in terms of losing money in the beginning, you said it’s about double. How long do you do that for? Bernie: Yeah, there’s no fixed time, it’s till it kind of catches fire. So it’s certainly weeks. If we’re in two months where we’re losing money, we’re starting to look at this as a failure scenario and everyone really scrambling to try to find other things other than just ad spend to kind of recover what might be a product headed for failure. Steve: I guess what is your definition of catching fire? Like is it based on conversion rate or? Bernie: It ultimately comes down to, are you executing to that business plan that you created at the beginning? Are you getting to top position on the keywords that you are aiming for? You’re probably not going to be completely there after a few weeks, but you hopefully are making really solid progress there. And if you’re not, that’s when you’re headed for the failure scenario. Steve: I see. So you’re monitoring your keyword rankings and for the competitive industries that you’re in, I can imagine that sponsored product ads will take you to the front page alone in just a couple weeks. So it sounds like you’re just monitoring the keyword advancement. Steve: And what is like good advancement? Like let’s say you start out nothing and in a couple of weeks, where do you have to be in order to deem that you’re making progress? Bernie: Yeah, I mean, it’s very category specific. First of all, you’ve got these very kind of deep competitive categories. And then also we’re looking at a range of keywords. Again, kind of going back to, we’ve got a few broad keywords that have, gosh, if we can be number one on this broad keyword, we would just be killing it. But we also have those very much more narrow, kind of key differentiators of the product that probably don’t have a ton of search volume around them. But if somebody is actually searching for that, ours is going to be a really great product for them. And so, we’ll tend to make — see visible progress on those key differentiators first, and we better, we should be able to see progress on those key differentiators first, and then maybe we even get to the top of those keywords and only then would we be able to kind of make progress in on some of these broader keywords, really kind of category level keywords because maybe these key differentiators we have identified are something that’s really compelling to the market. And because we do that thing, people say, hey, this is the best product in this category now, because it did these few things really well. Other times, it’s not enough that those key differentiators are interesting to a few people but not a lot of people. And then you might have something that is kind of a success, but it’s not really a category winner. Steve: So I don’t want to oversimplify Amazon ads here, because I know in real life when you start running ads, there’s a lot of things that can happen, right? So one, you might be bidding on something and you might not get any impressions for your keywords. You might not get enough clicks; your conversion rate might be super low. How do you deal with these different situations? Or what is your tool kind of doing behind the scenes that helps you address these issues? Bernie: Yeah, they’re really hard to kind of figure out, and so we actually almost had to create our tool before we understood this stuff. It’s a combination of doing it manually and then also coding it in the tool. So as the tool is doing these recommendations bid up, bid down, refine this keyword to be more phrase and exact, add these keywords, add this campaign, each time there’s a recommendation where the tool is giving a reason why, maybe the ACOS is below target, maybe this keyword is converting at this great rate, this very high conversion from impressions to clicks, we actually will say that right in the tool. So the way I actually use the tool is in a given week, I’ll get hundreds of individual recommendations for our own account within our own tool. And I’ll run through them and actually you can basically accept or reject each recommendation. I’ll run through them and kind of reject ones that are based on specific reasons, usually for us it’s compatibility that the recommendation the tool is making is not right from a compatibility perspective. But then other than that, I basically just accept all of them. But if I want to learn and kind of use the tools, the ad data to kind of understand where is this product succeeding and where is it may be weaker than we thought, we have all the data there and we have these reasons that for every recommendation, it’s kind of been put through an intelligent rules engine, and we can tell you why the tool is recommending what it’s recommending. Steve: What about the case when — and this has happened with a lot of the students in my class. They start bidding for a keyword that they think they should be indexing on but then Amazon doesn’t give that keyword a lot of impressions for some reason. Bernie: Yeah that’s right. Yeah, that’s actually a really key thing, if your keyword, if you’re not indexing on it organically, then there’s no sense bidding on it. You can bid up and up and up and Amazon either will give you zero impressions or just a handful. So, it’s actually not deployed right now, but one of the things we’ve actually added, it’s in the dev branch right now over the last week is just to check when you’re looking at the keyword. And usually what it will say is impressions too low is our reason. We just provide a simple button there where you can click and you go to a URL and see whether your product comes back on that marketplace for that term. And you can see whether it’s indexed or not. And if it’s not indexed, well, then this isn’t really an ad problem. You’ve got to work on that indexing problem first, with back end keywords or changes to your description. And then once that’s fixed, you can come back to ads. And bidding and assuming you fixed the organic indexing problem, now you’ll be able to start winning with impressions even with potentially lower bids. Steve: I was hoping you could provide some guidelines. So you’re in the process of looking up like what a good click through rate is at least for your category. Of course every category is going to be different. But I was just curious for electronics what that might be, and what a good conversion rate is for your electronics products in general. Bernie: Yeah. So let’s see. So we’ve got about — make sure I get this right, so about 1,000 impressions per sale is a norm. And so, let’s take it through the full steps of impressions to clicks to sales. So it’s about 50, so about 50 impressions per click and 1,000 impressions per sale approximately. Steve: So 2% click through rate, did I do my math — and what was the number of clicks to sale? Bernie: About 50, clicks to sale, I didn’t do clicks to sale. So clicks to sale is about 15 clicks for each sale. Steve: Okay so under a 10% conversion rate. So I’m just curious, what are your guidelines in general for a successful keyword for a given product? Bernie: Yeah, we’re focused on doing the ad adjustments. These ratios are super important and we want to see improvement in them. I think a lot of is category and product specific. So right now, eventually, I think a lot of those numbers we will have some recommendations in terms of you are way off of norm on the high side, congratulations. Or on the low side, and you probably should — the right action to take when a lot of these ratios are on the bad side is to improve your listing, or either make it or tighten your keywords. I mean, make your listing, your keywords more specific to your product, make your product more specific to what the audience wants, and then make your product high converting, good images, good text. And those are the ways that you can kind of move some of those ratios that we were just talking about. Steve: I guess my question is like your tool is based on ACOS. So does it even matter when the dollars come into play? Like as long as your ACOS meets a certain amount, does it really matter what your click through rate is, or what your conversion rate is? How does everything work together? Bernie: No, you’re right. It doesn’t. We present those numbers but those numbers actually aren’t needed to do any of the recommendations in terms of the ad adjustment. The ad adjustments really all kind of key off of that ACOS and the ability to set that ACOS at a per product level if you want us you really get kind of precise about this. And then within a product, you can set the ACOS kind of higher when you launch and then later adjust it lower when the product moves into a kind of a mature profitable phase. And the tool allows all of that. Steve: I guess if you’re someone doing sponsored product ads without any tools, and geez, you just want some general guidelines on whether what you’re doing is good or not, or if it could be better. So let’s say you’re meeting your ACOS targets, but clearly your conversion rate is low but you’re still you’re still meeting your target. But how do you know that you need to improve? Bernie: Yeah, it is hard I mean because — so how do you know you need to improve? I mean, well, a lot of it comes down to what’s happening kind of at the individual keyword level. If you’re over bidding on some overly broad keywords, you’re driving a bunch of wrong traffic to your ASIN and that’s costing you money. Even worse, sometimes in some product categories it’s actually believe it or not costing you reviews in the sense that if you drive the wrong people to your product, and they buy anyway, that’s a prime scenario for it to become a negative review in the end. So in a way it’s kind of cool because everyone’s motivations are lined up. I mean, you as a brand and as a seller, you want to drive people to your product who are going to be really ecstatic about this product, they’re going to be as soon as they see it, they’re going to want it. And as soon as they buy it, they’re going to be happy with it. But the way you achieve that is through keyword refinement, adding and removing keywords to kind of hone in on relevance and then you’re bidding up or bidding down, both for your business so that the keywords achieve the right profitability level, but also, so that you’re spending the money where it drives the most relevant traffic to you. So, it’s hard. I mean, for us, I mean, we have just within our account of we have tens of thousands of keywords across our whole tool. We manage over 10,000 ad campaigns and so millions of keywords that are managed across all the sellers that use our tool. It’s overwhelming. I mean, basically, before we had our tool and we were probably spending a little bit less on ads then, we had a kind of a full time person. He was spending about two to three days a week just managing the ads. And with the tool help, and there’s a bunch of great tools out there, not just ours. But with the tool help, he’s been able to get that down instead to like, three or four hours, like half a day. So it’s been a huge time savings. But we got to spend that time because if we’re not spending that time, we’re not honing in our ads and our ad spend to get the right people. And then the other thing that’s happening here that we hinted at is we’re training through these ads and through all this what’s happening with the keywords on these ads, we’re training Amazon search engine about what our products are relevant for. So this is not just about the people who buy based on the ad, it is actually a system for spending money to train Amazon about where your product is relevant so that in organic search, there’ll be showing your products for those keywords too. Steve: Right yeah. No, that makes a lot of sense. I’m just curious. So during launch, you said you’ll run and lose money for a little bit. How do you decide when to kind of taper it off and actually either choose to break even or make some profit? Bernie: Oh, gosh, how do we decide? I think it again; it’s that it’s that momentum level that we need to kind of fulfill the business plan. When we have products that fail, we often have way too much inventory and we go through this painful process of kind of unloading the inventory over way too long a time period. And there’s always questions in our minds of should we basically be paying to get rid of this inventory by spending money on ads, or should we just dump it on price and we use a variety of strategies. But in the more fun scenario of a successful product, we’ve invested and kind of gone negative in terms of our spending for a few weeks or maybe a few months and now the product is – Amazon is all trained up on what keywords this product is relevant for, our ads are humming, we’ve got our ACOS has really kind of dropped down to a healthy level, and we’ve moved to the kind of top position or our target position on the keywords and now we’re just trying to kind of maintain this product at that kind of level of run rate and level of keyword position with our ad spend and so we can kind of drop our target ACOS more into a profitable territory at that point. And of course all the organic sales are profitable. Steve: I guess your tool you said you have a target ACOS right? So does that imply that it’ll keep spending to try to get to that target ACOS, so does that in fact mean that if your product success, your ACOS will still drop, or will your tool just spend more to meet that target ACOS? Do you understand what I’m asking? Bernie: Yeah I do. Yeah. So the tool will always kind of manage to the ACOS if it can. And so it’ll be kind of recommending bidding up. So, yeah, I know it is true that we need to make the decision at some point in our tool to kind of drop our target ACOS to say, we’re shifting from kind of launch mode to profitability mode, otherwise, the tool will kind of keep going at that ACOS. So, this is actually where some of those other data points like a good conversion rate or just that our keyword search position that we keep talking about, that stuff getting healthy can be the signal to tell our tool to, okay, let’s kind of switch into profitable mode for this product. Steve: Okay, so I mean, is hitting the front page one of those criteria? I mean, obviously if you’re number one, you can dial it back. But I’m just curious what your criteria is. Bernie: Yeah, I think for those differentiated keywords, those highly targeted keywords, we want to be number one, not just front page. For some of the broader keywords, a lot of times especially if it’s a big category, we’ll be happy with front page. Amazon is a kind of all spoils go to the victor kind of market, a big head and a long tail. So, you can easily get a doubling of sales from second search position to first search position in some categories. So we’ll fight for first position if we can get there, but in some cases, it’s just not realistic and so we get the first position on things that the product is really special for and accept kind of just first page on some of the broader keywords. Steve: So in general, is your philosophy to break even on ads and then depend on the organic sales, or do you believe in making money on your ads? Bernie: Well yeah. So stepping back kind of bigger picture, we had really low ACOS a few years ago, so we were always making money on ads a few years ago. So this is a shifting picture. Today it’s more the model, it’s not are we wanting to break even or make money, it’s more that we’re going to lose money at first and then our products that kind of fail to achieve what we hoped for, we’re probably going to just lose money in total on the whole business plan for that product. But for our products that kind of make it, that become successful, we’re going to aim to be profitable certainly for organic of course, but also for our ad generated sales. Steve: I guess what I was trying to get at is there has to be some correlation between profitability and like you could lose money on ads but the flywheel spin so fast that you’re making more money organically, whereas if you’re making money on ads, you might be getting less organic sales. Is there a way, an easy way for you to test that and determine what the optimal bid is so to speak for a given keyword? Bernie: That’s actually a really great question. I think that is kind of the next step for us. I think we haven’t figured that out with our business and our tools don’t support thinking quite that way yet. But I totally agree that we know all the things I’ve said that it’s not just the ad generated sale, it’s how that spins up the flywheel. It’s not just the ad generated sale; it’s the lifetime value of the customer. But I think if you can turn those into numbers, it really could improve your decision making because then you could have a much clearer picture of, oh yeah, if we are breaking even on ads, that’s actually foolish, we should be always losing money on ads because we’re going to get even more back in organic and in lifetime value of the customer. So yeah, so I think our tools I’m aware of that. And I think we’re not yet smart about that. And our tools will be — I think you kind of need a tool help for that and our tools aren’t there yet, but we’ll get there. Steve: I mean, the only reason why I ask is like when I run Facebook ads, sometimes the numbers don’t work out, but I’m generating a lot more sales with my other channels. And miraculously, when I turn Facebook ads off, some of those other channels decrease along with it. So clearly, there’s a correlation, but it’s really hard to measure. Bernie: Yeah, yeah. And there’s some hope on Amazon that we might actually be able to measure all of it. And so we’ll be enhancing a lot more with our Efficient Era tool set and that’s a great example of an area where we need to. Steve: I mean, it sounds like to me, at least based on this conversation, it’s almost like you need a tool now, especially if you’re dealing with lots of keywords to kind of organize them and show you how to bid because it’s just too overwhelming to manage a whole bunch of keywords for a whole bunch of products. Bernie: Yeah, no, I totally think that’s true. And unfortunately, there’s a lot of good ad tools out there. I mean, there’s at least a half dozen that I can think of and ours is really good. We use ours to manage our own business. So, yeah, no, I think that’s right. It’s too overwhelming if you don’t use a tool. Steve: And Bernie, hey, I want to give you a chance to talk about your tool a little bit. So what would you say is the key differentiating factor? You just mentioned there’s a whole bunch of tools that help you manage your sponsored ads. What would you say is one of your key differentiating factors of Efficient Era? Bernie: Yeah, I mean, it’s kind of an all in one tool so there’s a few things. One is the ad tool is a great ad tool that is very transparent about the recommendations. So you can kind of choose to accept everything, or you can look at each one individually. And we’re very transparent about kind of this trigger. This reason caused us to make this recommendation so you can use to learn, you can get — it can be really picky and kind of you’ll keep control over things or you can just kind of let it run and just take its recommendations. Either way it saves you a ton of time. Because our tools kind of originally came from things that we developed for our own business, they’re comprehensive. They cover areas from profit dashboard to this ad tool, to post order emails, to review tracking, to comprehensive databases of all the Amazon information like orders that you can search through and filter and export different ways, returns tracking, product health looking at kind of reviews over time and how is the product doing. So, what we’re headed towards with their Efficient Era tools and we’ve gotten a long way towards this is really we want it to be not just an ad recommendation, but really a business recommendation engine. We’re constantly notifying you, hey, there’s this problem, somebody changed the category that one of your products is in, here’s an email alert and that’s one of the things we do, here’s how to fix it. Or here’s an opportunity, you’ve launched a product two weeks ago and you still don’t have a sponsored product ad for it, we’d recommend you go create a campaign, and here’s an automated tool that’ll do that for you, so that we’re really kind of an AI intelligent way of improving your Amazon business. And we’ve made significant progress towards that. Steve: Interesting. So I guess the eventual goal is to have everything talk to each other, right? These aren’t individual tools. They’re all tools that kind of work together. Bernie: Yeah, that’s right. And that’s pretty different. There’s some good tools out there that are very, like you say, are kind of very separate independent tools. Yeah, and we’re really different than that, because we’re highly integrated, we’re able to do a few things a lot smarter because we’re using all of the data to help make a smart recommendation. Steve: So for example, if I ran out of stock and I don’t know, will that ad stop, or close to running out of stock ? Bernie: Amazon stops the ad when you run out of stock and you no longer have the buy box. We are just about to launch kind of a comprehensive buy box notification that untangles when you lose the buy box, was it a pricing issue, was it an out of stock issue? Today Amazon suspends the ASIN and so you’re getting the dogs of Amazon, the dreaded dogs of Amazon when you go to your product, or all these different other reasons why you might lose the buy box. So we’ll untangle that. We’re not doing proactive turning off ads on triggers like getting low on stock, maybe that’s something that we might do in the future. Steve: Okay, well, hey Bernie thanks a lot for giving us a lesson on how you run Plugable. As I always mention, I think selling electronics is really competitive and borderline crazy, but you managed to make it work. And what I like about you is that you eat your own dog food, you have the tools that you actually use for your own business. So in fact, all of your words carry a lot more weight, at least to me. Bernie: Yeah, yeah, no, electronics is a hard space, but it means we are forced to get good at what we do. Steve: Absolutely. Well Bernie, thanks a lot for coming on the show. Bernie: Yeah, appreciated Steve, talk to you soon. Hope you enjoyed that episode. 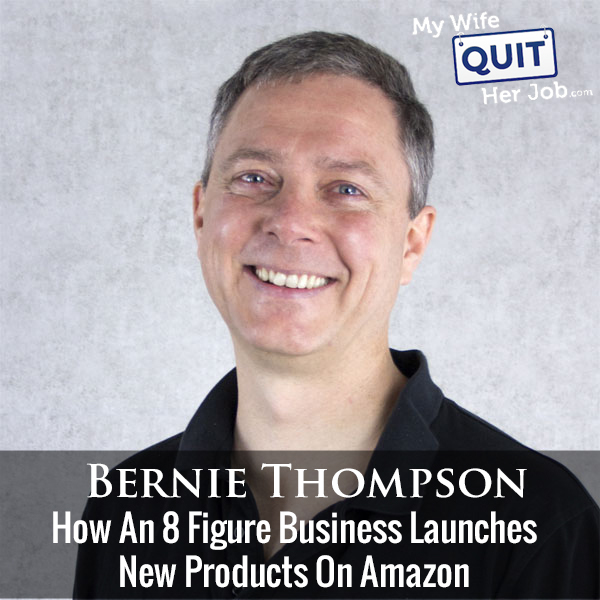 As an eight figure seller, and probably one of the most competitive markets on Amazon, Bernie goes through a lot of product. And because his margins are razor thin, he really has to optimize everything. And as a result, his processes tend to be super efficient. For more information about this episode, go to mywifequitherjob.com/episode230. And once again, I want to thank Privy.com for sponsoring this episode. Privy is the email capture provider that I personally use to turn visitors into email subscribers. They offer email capture, exit intent, and site targeting tools to make it super simple as well. And I like Privy because it’s so powerful and you can basically trigger custom pop-ups for any primer that is closely tied to your e-commerce store. If you want to give it a try, it is free. So, head on over to Privy.com/Steve, once again, that’s P-R-I-V-Y.com/Steve.